If you’re reading this, you’ve likely heard the benefits of giving your dog a probiotic. Studies on both humans and animals have suggested that these healthy bacteria have countless benefits to dogs, including balancing an upset digestive tract, alleviating allergies and itchy skin, managing stress, and much more. While we don’t fully understand the benefits of each specific kind of probiotic, each strain does appear to offer different benefits. For this reason, we recommend choosing a product that contains multiple strains, rather than just one. The strains of bacteria should be listed on the ingredient paenl, and often start with words such as Lactobacillus or Bifidobacterium. In order to be beneficial to your dog, probiotics must survive passing through a dog’s highly acidic stomach. With this in mind, the number of colony forming units (CFU) contained in a probiotic is critical, and the number should be as high as possible. We recommend choosing a product with no less than 3 billion CFU. Often inexpensive probiotics will contain far less than this amount, and are unlikely to be as beneficial to your dog. Probiotics come in many formats for dogs, the most common being a powder or a soft chew. Soft chews, while palatable to dogs who believe they’re getting a treat, can often lose their potency during manufacturing or after the package is opened. We like powders, but we’d advise again the tub and spoon style, which can allow in moisture that may destroy the product. Individual single use packets are ideal to preserve the product until use. Probiotics alone are often not palatable enough for dogs, so flavoring must be added. In our research, many brands include a questionable ingredient in their powder to boost the flavor. For example, the most widely distributed probiotic on the market, made by Purina, contains something called “animal digest” as the first ingredient. We recommend steering clear of undefined proteins, and choose a product with a single ingredient flavor booster such as beef or chicken liver. In order for probiotics to do their job, they must have a food source. Healthy gut bacteria feed on a type of fiber called prebiotics. While you can feed your dog natural sources of prebiotics from foods such as beans, peas, chicory root, and Jerusalem artichoke, these foods may not be the easiest to give to your dog, so we recommend choosing a probiotic product that includes a prebiotic ingredient, such as inulin. In order for a dog to actually receive the nutrition that’s in their food, their digestive system must be able to properly digest the nutrients. Kibble fed dogs often are lacking in digestive enzymes, as these microorganism cannot survive the high heat cooking process required by dry food. Dr. Karen Becker has called digestive enzymes “The Supplement Most Needed by Your Pet”. The ideal canine probiotic would also contain digestive enzymes in order to balance your dog’s GI tract in as many ways as possible. Which Probiotic Product Does iHeartDogs Recommend? 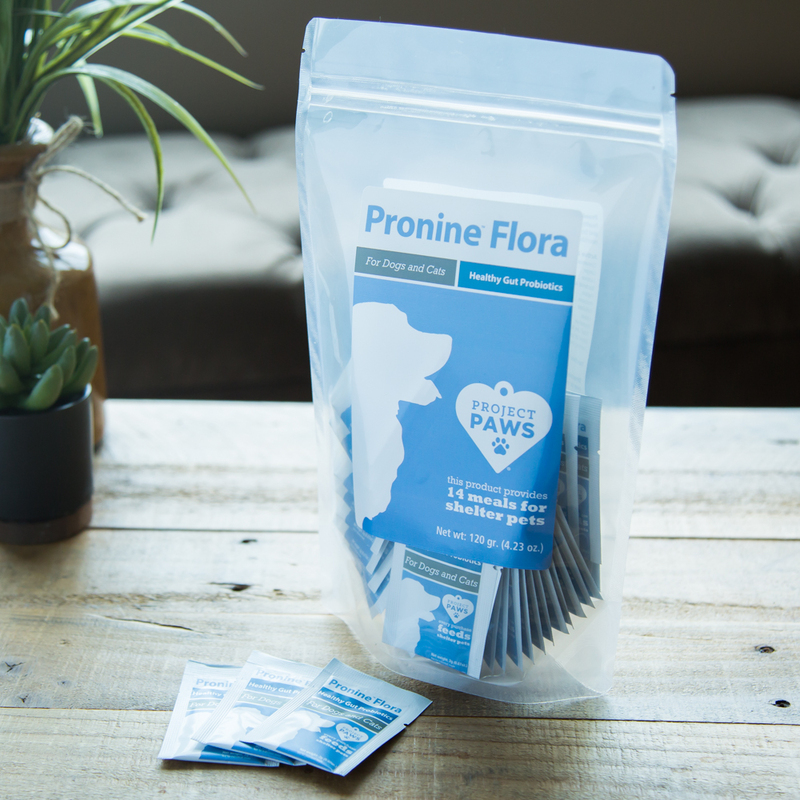 The team at iHeartDogs was fortunate enough to be consulted on the creation of a supplement called Pronine ™ Flora, which is a 4-in-1 product containing probiotics, prebiotics, digestive enzymes, and digestive herbs. With 5 billion CFU from 3 different probiotic strains, we believe this product to be the most balanced and complete canine probiotic formula available. Whatever product you choose, we hope this information was helpful, and trust that you have your dog’s best in mind. Always consult your veterinarian and do your own research before choosing any product for your precious pup.